Wild Turkey tells BourbonBlog.com that they will soon release a new, limited-edition, small batch, 91-proof mingling of Bourbon and Rye whiskey that found its way accidentally into the whiskey line-up of the famed distillery in Lawrenceburg, Kentucky. This is a first-of-its-kind offering from Wild Turkey Bourbon featuring a unique blend of 78%, 6-year-old Bourbon and 22% rare, high-proof Rye hand-selected from Wild Turkey’s signature No. 4 alligator charred barrels. 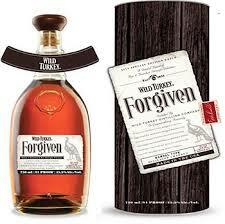 “Forgiven marries the best qualities of Wild Turkey’s big, flavorful Bourbons and Ryes,” says a spokesperson for Wild Turkey. The price will be around $49.99 / 750 ml bottle. We’ll bring you our review of Forgiven soon on BourbonBlog.com. For now, Wild Turkey tells us the Bourbon and Rye flavors complement the best of each other to create a bold, creamy vanilla and oak opening, and a long, smooth finish with hints of pepper, clove and cinnamon. Apparently, story has it that …. The distillery crew at Wild Turkey mistakenly mingled a very rare, high-proof Rye with perfectly-aged Bourbon, Associate Master Distiller and Kentucky Bourbon Hall of Fame member Eddie Russell, discovered they had unwittingly created something exceptional. The result was The resulting whiskey knocked Eddie’s socks off and a story of consequence was born. This super premium liquid from one of the most revered U.S. spirits brands will dazzle whiskey lovers looking for an unconventional choice, and mesmerize those lucky enough to snag a bottle before quantities run dry.